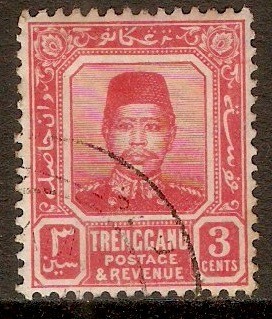 Trengganu 1910 1c. Blue-green. SG1. Mounted mint 1910 1c. Blue-green. SG1. 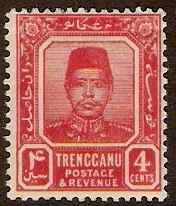 Trengganu 1910 3c Carmine-red. SG3. Fine used 1910 3c Carmine-red. SG3. 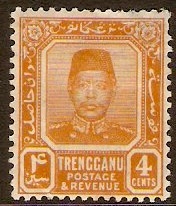 Trengganu 1910 4c Orange. SG4. 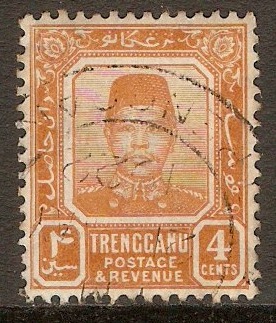 Fine used 1910 4c Orange. SG4. 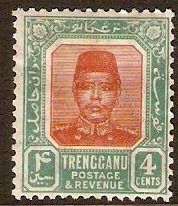 Trengganu 1910 4c. Orange. SG4. Some damage 1910 4c. Orange. SG4. Gum torn away on back top left of stamp. Spacefiller. 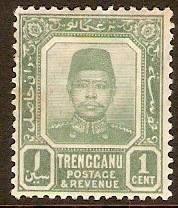 Trengganu 1910 4c. Carmine-red. SG5a. Some damage 1910 4c. Carmine-red. SG5a. Slight crease along top of stamp. 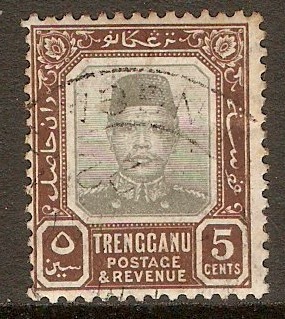 Trengganu 1910 4c. Red-brown and green. SG5. Heavy mounted mint 1910 4c. Red-brown and green. SG5. 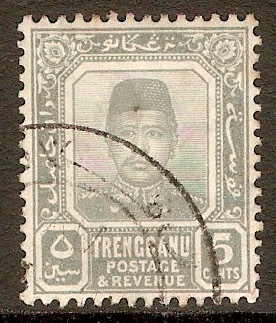 Trengganu 1910 5c Grey. SG6. Fine used 1910 5c Grey. SG6. Trengganu 1910 5c Grey and brown. SG7. Fine used 1910 5c Grey and brown. SG7. 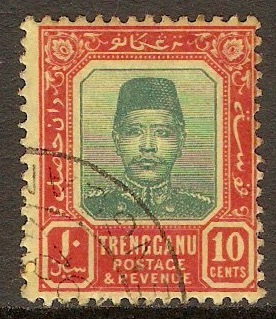 Trengganu 1910 10c Purple on pale yellow. SG9a. Fine used 1910 10c Purple on pale yellow. SG9a. 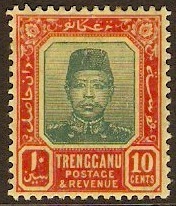 Trengganu 1910 10c. Green and red on yellow. SG9. Mounted mint 1910 10c. Green and red on yellow. SG9.